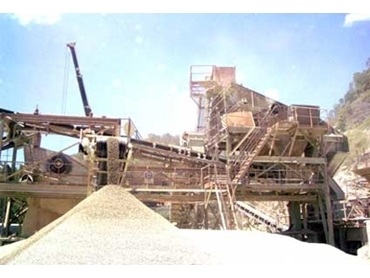 Dust suppression systems from OEC Industrial offer a low cost solution to dust control problems in recycling, concrete crushing and mining environments. OEC fogging systems reduce dust levels in the working environment and control dust emissions in the neighbourhood. The fogging system directs water at high pressure through a battery of ultra-fine nozzles to create millions of ultra-fine micro-droplets, which adhere to individual dust particles, causing the now heavier dust to fall to the ground. OEC fogging systems can keep otherwise dusty sites significantly dust-free even under difficult hot and dry conditions. The fog nozzles can either be installed in the ceiling of a building for blanket dust reduction or on dust producing plant and equipment such as jaw crushers, cone crushers, transfer points, vibrating screens and air knives. Joe Lynas of Delta Recycling comments that he would happily recommend the OEC fogging system to any organisation with a dust problem. Located within 10km of the CBD and only 5km from a residential area, Delta Recycling’s site has been able to conform to EPA regulations and has received no complaints, thanks to the OEC industrial misting system. OEC engineers installed the equipment overnight to avoid disruption of production. OEC customers include Argyle Diamonds, Resourceco, Metro Demolitions, FRH Astec Quarries, Southern Metropolitan Regional Council (Bedminster Plant) Compost Production and Northern Adelaide Waste Management Authority.